Make Public - Making a recording public generates a URL for Sharing. Anyone can view the recording at the URL for Sharing - CCID login is not required. Make Private - Making a recording private removes and disables the URL for Sharing. Note: making a recording private and then public again will result in the same URL for Sharing to be generated. This way if the recording accidentally gets made private, there is no need to re-distribute a new URL when the recording is made public again. Hide - Hides the recording from everyone except for meeting hosts on the course page. If the recording is public, it is still possible to access it via the URL for Sharing. Show - Un-hides the recording from students on the course page. 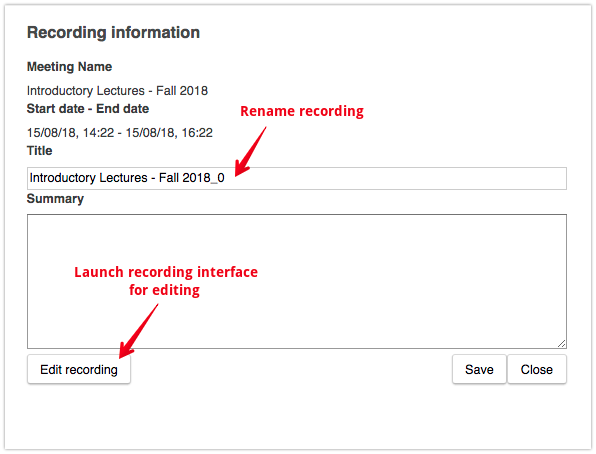 Edit - Pop-up to edit Title and Summary of recording. This dialogue has an option to open the recording in the eClassLive interface to perform basic edits including trimming dead space, adding chapter headings, and more. Make Offline - Making a recording offline downloads the video to your local computer. Recordings must be public to download. Because of the way that eClassLive recordings are saved, they cannot simply be downloaded as a video file - they must be played back in real time to be saved as a file on your machine. For more information on this see Converting Recordings to Offline Files. List (Viewed) - Pop-up with a list of users that have viewed the recording. 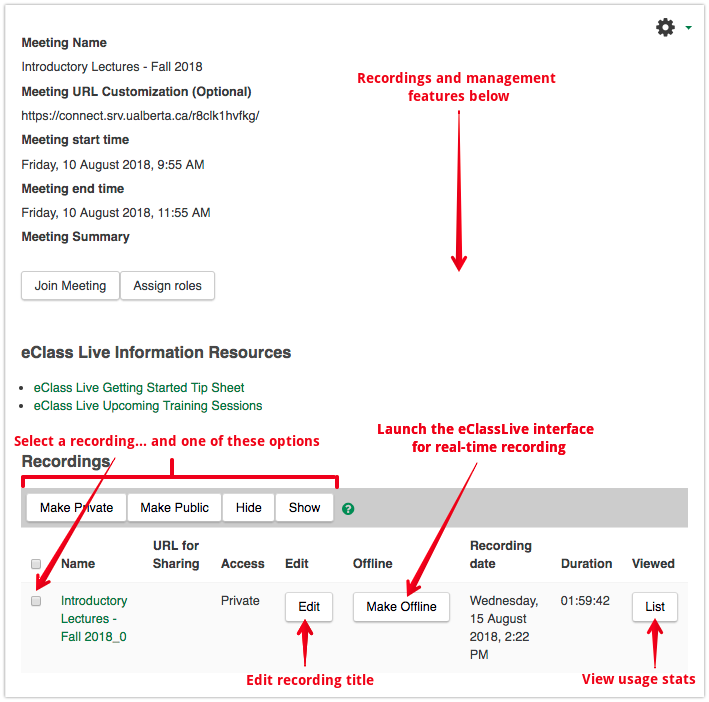 For more information (and other available participation statistics), see the article Viewing Usage Statistics for eClassLive Sessions and Recordings.